Mauricio de Freitas is IN & ICI & WHO Vice President of Brazil. 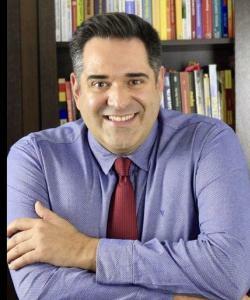 Maurício de Freitas is the founder, CEO and Chief Knowledge Manager of InsideYou. The internationally accredited company focus on personal and professional development providing training in Coaching and NLP. He is also one of the creators of InsideYou Online, a gamified virtual learning environment designed to offer high quality e-learning for personal and professional development. The startup has created a virtual environment for distance coaching sessions through video conferencing. The platform also hosts administrative resources for Coaches. Rigorous criteria are applied in the process of selection of coaches to guarantee each customer is assigned to the most suitable professional. Maurício imparts Coaching and NLP training using the Exponential Minds methodology. In 2017, as a result of his constant work to coherently unify knowledge from different lines of thought in human development, he created the Exponential Minds methodology. Aiming at raising human development to a higher level of efficiency, it unites knowledge from the three generations of NLP, Coaching, Social Panorama, Neurosemantics, Spiral Dynamics, Systemic Structural Constellations and U theory. This methodology gathers powerful tools to enable the modern man to deal with contemporaneous challenges. Among the main features of our current challenges are the dematerialization and demonetization of products and services, extinction of job positions, frequent changes and volatility, uncertainty about future events, connectivity and interdependence creating problems with a high level of complexity, and ambiguity - the VUCA World. Maurício is the Brazilian vice-president of ICI (Coaching), IN (PNL) and WHO (Hypnosis). These associations are responsible for ensuring good practices, promoting quality and ethics among professionals and providing professional training courses in 63 Countries. Maurício de Freitas has committed himself to guiding Brazilian coaches and trainers toward the internationally required high standards. Communicators, coaches, NLP practitioners, and trainers can count on Maurício’s expertise. He supports excellence in the professional practice by providing human development training courses, mentoring, supervision and guidance for continuing education. Previdência Social, Beiersdorf/Nívea, Farmácias Center Fómula, UFTM – Universidade Federal do Triângulo Mineiro, SESI-FIEMG, Oxigênio Aceleradora – Aceleradora de startups da Porto Seguro, Hospital São Camilo, Yamá Cosméticos, Universidade Anhembi-Morumbi, Copeli Cosméticos, Prelúdico, Dr. Métricas, among others. Turning dreamers into makers is Maurício de Freitas’ leading motivation. So, this senior professional upholds people and organizations committed to doing their best to make this world an increasingly better place. In his words, it is a revolution orchestrated by the competence and determination of those who, dissatisfied with the current world order, have decided to create the future they wish to live. At the end of the 80s, after a brief technical career in computer programming, Maurício devoted himself to his great passions: Music and Performing Arts. He attended Popular Singing Course at Universidade Livre de Música (ULM), Lyrical Singing at Escola Municipal de Música (EMM) and at Fundação das Artes de São Caetano do Sul (FUNDART), where he also graduated in Performing Arts in 1990. He studied interpretation, body expression, clown, musical theater and theatrical direction with Cibele Forjaz, Roberto Lage, Chico de Assis, Fernando Vieira, Mirian Muniz, Zebba Dal Farra, Suzana Salles, Bond Street Theatre (England), Denilto Gomes, José Maria Carvalho, Leonardo Medeiros, Renato Borghi, among others. During this period, he worked with names like Ulisses Cruz, Antonio Fagundes, Antonio Petrin, Cacá Carvalho, Matheus Nachtergaele, Cibele Forjaz, Antonio Araújo, among others. He also participated in television series and Commercials. At one point, he was invited to teach drama classes for two groups: SBC undergraduate students in Law who wished to disinhibit themselves to be able to successfully face audiences; and Roberto Freire’s Soma therapy students whom wanted to overcome blockages and experience self-knowledge through drama classes. Due to the constant demand of those kinds of groups, in 1991, he started to pursue the Human Development area of study. Maurício gave courses in NLP, gestalt therapy, complex thinking, systemic thinking, hypnosis, psychosynthesis, Quantum Physics, biodanza, emotional co-dependence, group dynamics, among others. His most successful courses at that time were Singing & Therapy, Human Potential Development Program (HPDP), and Emotional Freedom which combined group dynamics, physical, artistic and therapeutic techniques and led him to appearances on TV shows (Globo, Gazeta, Record and Bandeirantes) to interviews on Radio (Record, Brazil 2000 and Jovem Pan) and to have articles published in magazines (Boa Forma and Planeta) and newspapers (O Estado de São Paulo). His strong business vision led him to undertake for the first time in 1997, when he founded an extremely innovative company in human development. Iluminati integrated a living area, a space for events, a coffee shop, art exhibitions with training courses, concerts, and therapies. As the CEO of this company, in addition to holding events, he also organized travels with focus on human development, both in Brazil and abroad. Some of the companies who could count on his services were Associação Palas Atena, Consciência Cósmica, Espaço Terapêutico Saint Germain and Espaço Nova Visão. Maurício was a successful radio presenter, being responsible for one of the largest audience programs, Perspectiva, aired on the 95.7 FM broadcaster. He repeated success with the programs Vida em Foco and Nova Visão, being on air until February 2017 (20 years). In his constant search for improvement, he wanted all his customers to have long-last and real learning, without refocusing on behaviors that should have already been modified. So, in 2001, despite the success he had achieved, he decided to venture out in search of new knowledge and more effective techniques and left Iluminati. In 2006, having acquired unique knowledge and experience, he emerged from this sabbatical period to reinvent his career. He became one of the greatest Brazilian specialists in Coaching and Third generation NLP - which have proved to be effective and powerful to support people to achieve and consolidate changes. Six years later, InsideYou, an organization focused on developing people and companies committed to giving the best of themselves and leaving a legacy for the planet, was born. In his preparation process he was trained by international names such as Robert Dilts (USA), Deborah Bacon Dilts (USA), Tom Best (USA), Sabine Klenke (Germany), Lucas Derks (Netherlands), Bernd Isert (Germany), Sean Xenja (USA), Guillermo Echegaray (Spain), Dr. Michael Hall (USA), Arline Davis (USA/Brazil), Eva Wieprecht (Germany), Stephen Gilligan (Usa), Meir Schneider (USA), Angela Bachfeld (Germany), Martin Shervington (England), David Murphy Ruiz (Mexico), Germaine Rediger (Belgium), Colin Cox (New Zealand), Lena Gray (New Zealand), Mandy Chai (Hong Kong) e Alan Fayter (New Zealand). Maurício attended courses with National teachers and coaches such as Humberto Mariotti, Juan Ribaut, Roberto Freire, Roberto Ziemer, Madalena Junqueira, André Percia, Jairo Mancilha, Clóvis Nakamoto, Clara Pelaez, among others. All this background led Maurício de Freitas to have a great vision: the creation of a methodology to raise human development to a much higher level, one that can enable the human being to deal ingeniously with the challenges emerging in the modern world. It was in 2017 that the Exponential Minds<sup>®</sup> methodology was born.